The invention of iron sights made rifles accurate and precise and transformed them from mere metal spraying sticks to an invincible weapon. Iron sights are still used and are important to teach shooters the basics of aiming. Technology has replaced them to a wide extent with increasingly powerful scopes, but the importance of sights has still not faded. Here we’ll be talking about the importance of an iron sight and how can you choose one for your AR-15. We will also review some of the best AR-15 iron sights available on the market to help you make a choice. Sights are still not a thing of the past. Technology might have given us planes to fly, but we still need legs and must learn to walk. The same is the case with iron sights. There are a ton of different types of optics out there. Ranging from AOC, MARS, red dot sights - you name it. It doesn’t matter what optics you use. But you still should learn the basics of sight calibration and aiming (creating sight pictures and all that stuff). An iron sight is helpful in teaching an amateur the basics of aiming and shooting. The latest optics are great for sighting distant targets properly, but you still need to learn basic aiming skills. Coming to the more logical part, using iron sights is an undoubtedly reliable backup for your AR-15. We know optics are somewhat delicate and they are susceptible to breakdowns. Maybe your optic’s battery dies or gets broken during a hunting trip. But you can still use iron sights to aim and shoot targets precisely, even if you may not achieve the same range. Iron sights need no electric power to operate and are tough as a rock to bear even the most rigorous thrashing - important factors for any shooter, but especially if you’re planning to use the rifle in a SHTF situation - or a zombie apocalypse. Your sights are going to be there and stay in place even in situations where other devices may fail. Wrapping it up, we can say iron sights are a good backup, teach you to rely on basic shooting skills and are of course are less expensive than optics. Before choosing an iron sight for your AR-15, there are several important factors you might consider. A balanced combination of these characteristics will result in a reliable and durable iron sight for your rifle. As the name suggests, a flip-up sight can be flipped up when needed and folded down when not. On the other hand, a fixed sight stays erect all the time. Flip-up sights are the most common ones manufactured these days. They can be used in conjunction with optics since you can fold them down to keep them out of your way. Fixed sights, on the other hand, are more durable and tough. Stainless steel, aluminum and polymer are the three most commonly-used materials for manufacturing sights. Steel sights are extremely tough and long-lasting but heavier in weight. Polymer is lightweight but not very durable. Aluminum falls in the middle with the strength of a metal and light weight of a polymer. But using stainless steel sights is however recommended for durability. Often all sights manufactured from these materials are referred to as “iron sights” even when they’re actually polymer or aluminum. Some iron sights might require you to use an allen wrench, screwdriver or even coins to make adjustments in windage and elevation. You must prefer choosing sights which have a knob or a gear to make adjustments using your bare hands. Another important factor is the visibility. There are hi-vis and tritium posts available on the market which glow in the dark and offer better visibility with or without NOD’s. Aperture, which is also known as the peephole, is used to aim at targets and helps in creating a proper sight picture. Iron sights may feature different aperture styles such as a diamond aperture, hollow aperture and others. Apart from that, iron sights of different styles are also available on the market. This specifically refers to 45-degree (offset) sights which can be used by tilting the rifle and are very useful when transitioning between long-range and short-range shots. Let’s have a look at a few sights that could make your shooting more accurate and fun. 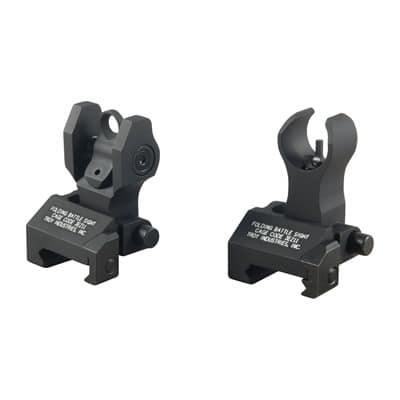 This iron sight set from the renowned manufacturer Troy Industries Inc. is an HK-style same-plane sight. The sight features a flip mechanism which locks it in place. The spring-loaded button on the sides prevents the rear sight from accidentally flipping up or down when not needed. The rear features two different aperture styles. The large one provides a wide field of view for close range targets whereas the smaller aperture helps in shooting long-range targets. These sights can be attached to any standard Picatinny rail using a flathead screwdriver. These sights are also available in a self-illuminating tritium dot variant for shooting in low-light conditions. This integrated sighting system features a diamondhead aperture which provides specific reference points to help you center eyes on the target instantly. These sights are made of 6061 T6 aluminum and have a type III hardcoat anodized matte black finish. This is a same-plane iron sight featuring a flip-up design operated by a manual mechanism which also helps the sights remain zeroed in. The front sight has angled ears to protect the A2-type post and serve as a visual reference point. The rear sight features dual same-plane short- and long-range apertures. Overall, the iron sight features an amazing design providing you features close to an optic. This Mbus Gen 2 sight set from Magpul is an amazing pair of sights for your AR-15. It has been manufactured using injection-molded reinforced polymer. This means it’s both lightweight and sturdy enough to last a few years. This sight set features a spring-loaded ambidextrous mechanism which can be used to fold down the sights with a simple button push. This is a same-plane sight which takes less than one inch of space on your Picatinny rail and locks securely with a steel crossbolt. The windage-adjustable rear sight has two apertures. This is a low-profile foldable sight which can be used precisely in conjunction with other mounted optics. Ozark Armament offers this super-cheap alternative if your sights are just going to be BUIS. These flip-up sights have been manufactured from milled aluminum and have a spring loaded mechanism for quick deployment. These are same-plane sights which can be mounted on the rail of your AR-15. The rear sight has click adjustments for windage and features both precision and CQB apertures. The package includes an allen wrench which can be used to install the sight on the rail of your AR-15. 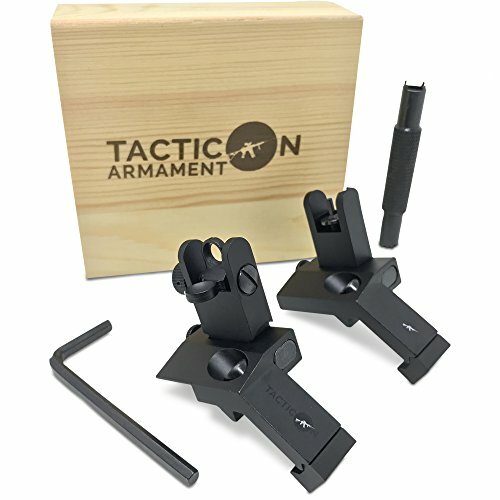 These iron sights are an amazing option if you don’t want to spend a lot of money and still need a good piece of aiming equipment. The manufacturer offers a one-year warranty on this product and the customer support from Ozark is outstanding. These FAB Defense sights are made of a combination of metal and polymer and feature a foldable design. They are lightweight and durable due to the material combination and offer ambidextrous deployment and control. The spring-based locking mechanism keeps the sights in place when flipped up or down. There are finger adjustments for elevation on the front post and windage on the rear. 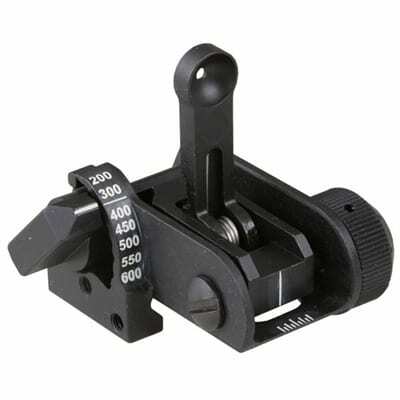 These same-plane mounting sights do not occupy much space on the rails and can be operated easily and quickly. The low-profile design does not meddle with other mounted optics. It’s compatible only with mil-spec Picatinny rails. 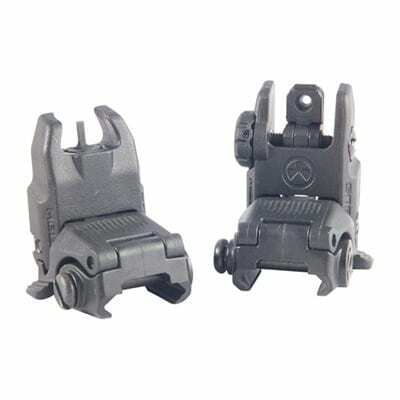 AR-15 iron sights come in a couple of varieties, namely gas block sights and same-plane sights. Their name itself suggests their position on your rifle. The basic principle is that you need to have the front and back posts at the same height to aim correctly. In gas block sights, the front post is mounted on the gas block on the muzzle and the rear post is mounted on its usual position (on top of receiver’s rear end). The front post is almost a quarter-inch longer than the rear one to compensate the drop between the receiver and muzzle’s height. On the other hand, posts in same plane sights are of the same height and are mounted at the same level. 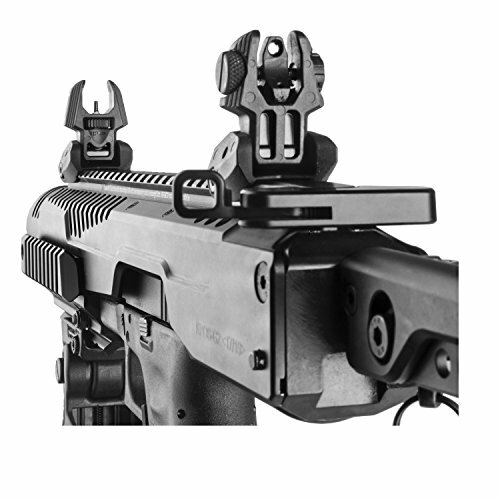 The front post is mounted on the top forward end of the rail/handguard and the rear post is mounted in its usual position. Using a gas block sight might save you some space on your rails as compared to same-plane sights. In the end, using either of these with your AR-15 is only a matter of personal discretion. 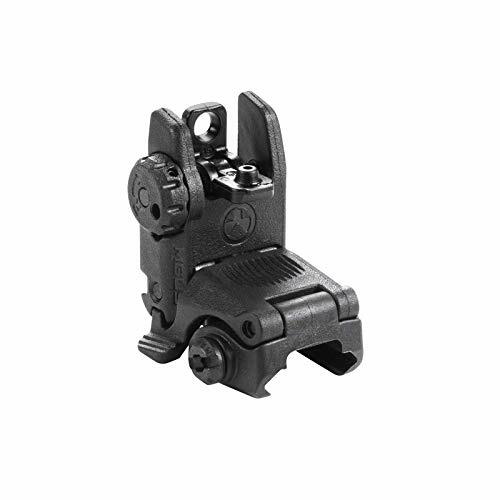 Flip-up iron sights are designed to be used as a back-up for a primary optical sight. Some users, including seasoned special forces personnel, see no need for this precaution as optics rarely, if ever, fail. But they can, and no one wants to be helpless in a gunfight or become a liability to their team. Paired with proper training, a flip-up iron sight is, therefore, a type of life insurance. Two main alternative forms of back-up iron sights exist, the in-line fixed iron sights and offset ones. In-line fixed iron sights will co-witness with your primary, non-magnified optic, which means they will obscure the lower portion of your sight picture. On the plus side, they have fewer moving parts than a flip-up, so there is less that can go wrong. Any proven flip-up iron sight will be robust enough to bet your life on, though there are design differences to look out for. Offset iron sights sit off the top of the firearm at a 45-degree angle. This means that even if the lens of your primary optic is broken or foggy, you can simply tilt your rifle at an odd angle and keep on rocking. The downside of offset sights is that they are prone to get snagged or knocked around. Their placement can also be limited by shell deflectors or forward assists. 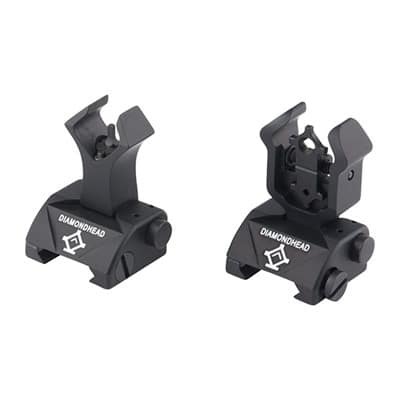 In-line flip-up iron sights shine, particularly with a QD primary optic. Offset flip up irons arguably combine the best of both worlds. There is a vast selection of AR-15 iron sights on the market, with quality and value for money varying wildly. Below we provide our selections of the best AR-15 flip-up iron sights available today. As the current U.S. Army standard issue, this sight has some serious street cred. This sight has been rigorously tested by the military and proven to be rugged and foolproof. As such, it is constructed of machined steel. It is designed to be a reliable, low-profile flip-up backup sight, and fills this role beyond reproach. The aperture securely locks up into position. It does not include a front sight, so you will have to purchase that separately. Of course, it is designed to pair with a standard A2 sight, but many alternatives exist. The most distinctive feature of this sight is the eight-position, detent-locking range selector, with 50-meter increments out to 600m. All controls and adjustments, including windage feature positive, tactile knobs and controls, no separate tools needed. Range and windage also feature clear, white, laser-etched markings for repeatability. The entire unit has beveled edges and corners to reduce catching. When a unit is U.S. military standard issue, you know that it's going to be reliable, tough, and get the job done for a reasonable price. This is not designed to be a primary match sight though some shooters are satisfied with it as such. Besides being an outstanding flip-up sight, this is a little piece of living firearms history. When it comes to the fit, finish, and material of our firearms, it is amazing how a tough guy becomes a little Liberace and primadonna. The space age was the 1960s and we're now somewhere way beyond that. As such, we shouldn't be allergic to non-steel components on our firearms. Everyone familiar with Magpul's legendary MBUS sights has been miraculously cured of steel-diva-itis. Polymer is the future. These sights are almost as well battle-tested as the U.S. military standard-issue ones. 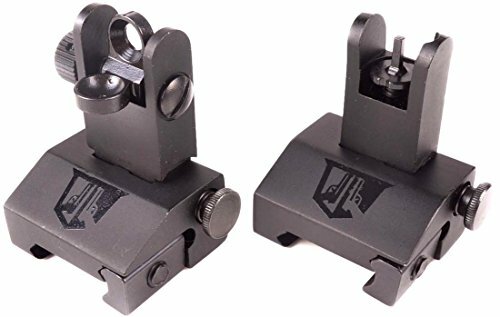 They have exactly the same height-over-bore as the military-standard A2 sights, allowing natural co-witness with any standard non-magnified optical sight. Windage can be adjusted by hand on the rear sight with a positive detent knob. The elevation is adjusted on the front sight with a standard tool, which it ships with. These spring-loaded sights are great for ambidextrous use as they can be flipped up from either side or by pressing on the top. Although they don't lock hard and fast into place, the detent retention is reliable. Magpul is a market leader for a reason. These are perfect backup flip-up sights that will stay out of sight and out of mind until their time comes. When symmetrically rounded HK-style sights have been around so long, it has often baffled me why so many of us continue with M1-style three-pronged sight picture. 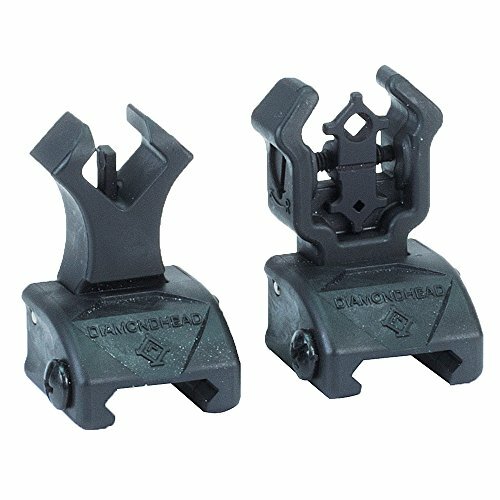 Diamondhead threatens to make both options obsolete with their patented symmetrical front and rear diamond-shaped sights. The diamond shape on the front sight housing matches the contours of the rear sight, which has well-defined reference points at each corner of the aperture. This allows the target to be acquired much faster. Sight picture acquisition is aided by a coating of Nitebrite, the poor man's tritium, on the forward post. This is another set of sights constructed mainly of polymer. Remember though, with trauma forceful enough to permanently bend steel out of shape, polymer can bounce and retain its shape. This is backed up by Diamondhead's lifetime warranty. Unlike the Magpuls above, these sights lock firmly into place. You may find that the unusual profile of these sights takes up a bit more space, although they do lock down out of sight. If you haven't given this patented diamond-shaped aperture a try, do yourself a favor. Many of the pros have switched over and now swear by them. 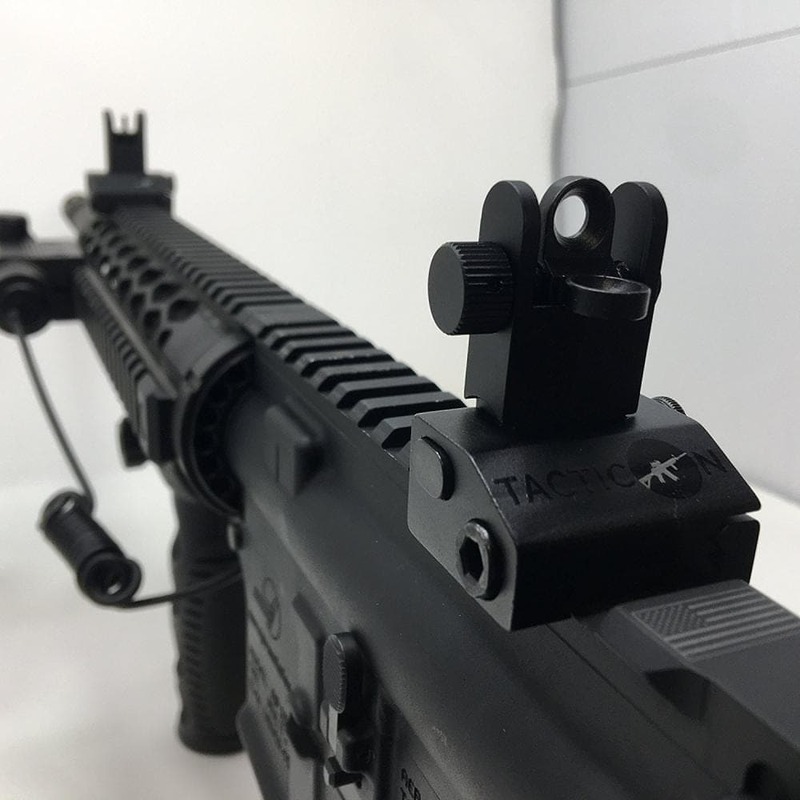 This set of sights from Tacticon Armament provide a classic post and aperture pairing that is optimal to the state of your primary optical sight. Unlike the other sights on this list, if your primary optic becomes obstructed in any way, with these sights you can maintain on target without figuring out how to unblock your line of sight. Simply flip up the sights, tilt your rifle, and keep on rocking. Other than being an offset sight arrangement, this unit is a classic design. If you have used a classic two-size aperture arrangement with a front post, you have the transferable skills to use these sights. Windage is adjusted by a tactile knob on the rear sight. Elevation adjustment requires a standard tool which is shipped with the unit, as is an Allen wrench for mounting the sights on the rail. The sights flip up with a quick push of a button. These are a great value for offset, flip-up iron sights. They take a little extra getting used to, but on the plus side, you're not rendered defenseless if your primary optic is obstructed. Construction material is an overrated consideration in selecting flip-up iron sights. If the company is reputable, the material will be robust, whether steel, aluminum, or polymer. 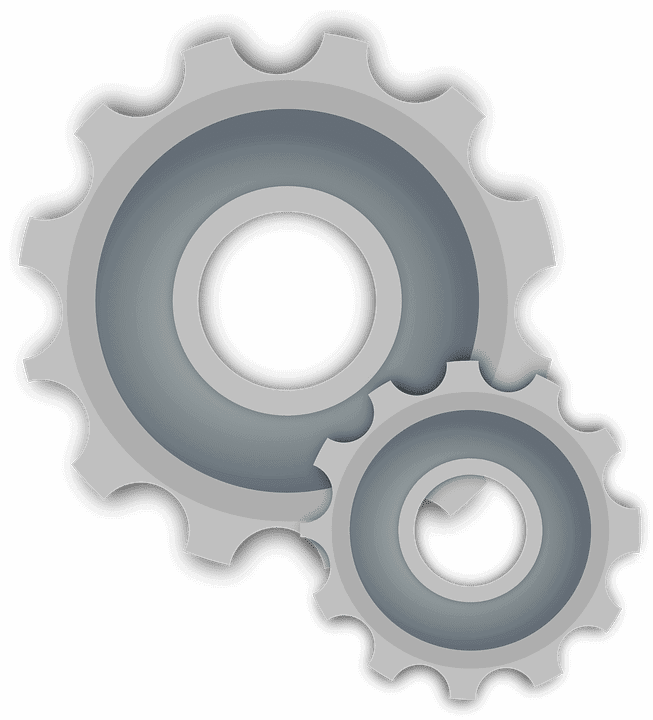 The design and build quality are far more important, especially the spring and retaining pin quality. 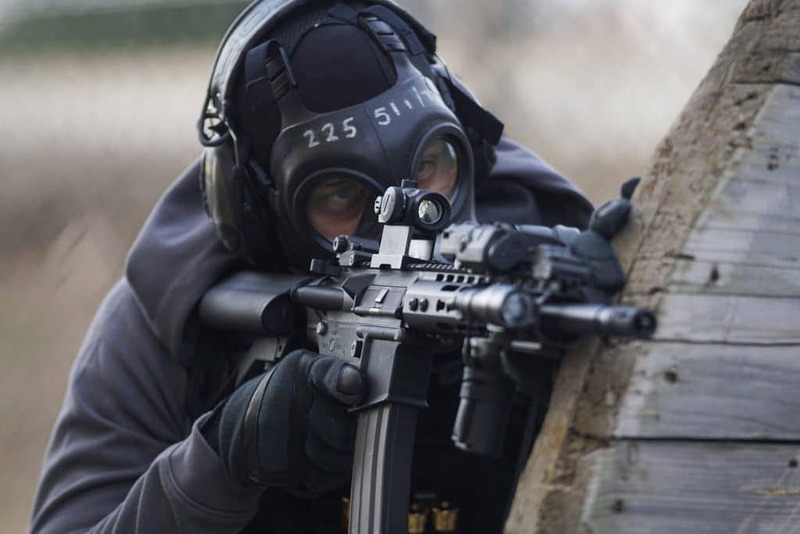 Ideally, flip-up iron sights will lock into place when deployed, no shock should be able to knock them into the horizontal position in a sticky situation. Ergonomics and ease of use make a big difference. Tool-free adjustability of windage and elevation can be very handy if your sights take a knock out in the field. Whether a set of sights is in-line or offset, subtle details like beveled edges and total protrusion determine how much they snag and get knocked around. If you are a lefty, make sure the sights are ambidextrous. In-line sights should be designed for absolute co-witness or lower-third co-witness. Absolute co-witness means that the sight plane lines up perfectly with that of your primary optical sight. Lower-third co-witness places the optical sight's sight plane slightly above that of the iron sights, giving you a more open sight picture. There is a huge variety of options for your sight picture. The classically-known U.S. Military sight picture is a post inside a Y-shape seen through a round aperture. The Germans prefer a more rounded housing around the front post, which intuitively lines up with the outline of a round aperture. Recently, the diamond-shaped aperture and front housing have shot up in popularity. Iron sights are an important component of an AR-15 which not only help in teaching the basics of shooting to amateurs but also serves as a backup. Iron sights are durable and stronger than optics and will serve as your backup if batteries dry out or your optics get damaged. Before choosing an iron sight for your AR-15, you should consider several factors such as material, aperture type, ease of use, visibility, design (flip up or fixed), mounting options and type (gas block or same plane). Flip-up iron sights for an AR-15 are a backup, an insurance policy against the failure of your primary optical sight. Although you may never need to use them in a life and death situation, you will need to train with them regularly just in case. Whatever your taste in material or aperture design, the sights above will serve you well.